Product #21172 | SKU 258962 | 0.0 (no ratings yet) Thanks for your rating! 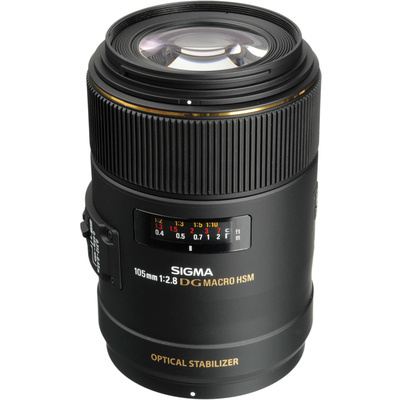 The Sigma 105mm f/2.8 EX DG OS Macro Lens for Sony Cameras delivers superb, distortion-free images throughout its broad focus range, from infinity telephoto to life-size ( 1:1 ) macro, as close as 31 cm without accessories. A Special Low Dispersion (SLD) lens and one high refractive index SLD lens provide excellent correction for all types of aberration and distortion. Its non-rotating front lens group makes it easier to work with polarising filters. A focus limiter helps divide the broad focus range into more manageable chunks. The "focus-free" mechanical design allows the lens to autofocus without any interference from the manual focus ring, making it easy to hold the lens without affecting the speed or normal operation of the autofocus function. Rugged mechanical construction also makes it durable enough for even the heaviest use required by professional photographers. This is an ideal lens for a wide variety of applications from nature photography to portraiture. The improved DG lens design for this lens corrects for various aberrations. This macro lens is specially coated to get the best colour balance while cutting down on ghosting caused by reflections from the digital image sensor. The lens provides the utmost correction against lateral chromatic aberration which is a serious problem for digital SLR cameras. Sigma's own proprietary OS (Optical Stabiliser) system enables handheld close-up photography.